Modern metropolitan areas include vast concentrations of economic activity, with Greater London and New York City today accounting for around 8.4 and 8.5 million people, respectively. These intense population concentrations involve the transport of millions of people each day between their residence and workplace. Today, the London Underground alone handles around 3.5 million passenger journeys per day, and its trains travel around 76 million kilometres each year (about 200 times the distance between the earth and the moon). Yet relatively little is known about the role of these commuting flows in sustaining dense concentrations of economic activity. On the one hand, these commuting flows impose substantial real resource costs, both in terms of time spent commuting and the construction of large networks of complex transportation infrastructure. On the other hand, they are also central to the creation of predominantly commercial and residential areas, with their distinctive characteristics for production and consumption. In our recent CEP discussion paper we use the mid-19th century transport revolution from the invention of steam railways, a newly created, spatially disaggregated dataset for Greater London from 1801-1921, and a quantitative urban model to provide new evidence on the contribution of the separation of workplace and residence to agglomeration. London during the 19th century is arguably the poster child for the large metropolitan areas observed around the world today. In 1801, London's built-up area housed around 1 million people and spanned only five miles East to West. In contrast, by 1901, Greater London contained over 6.5 million people, measured more than 17 miles across, and was on a dramatically larger scale than any previous urban area. By the beginning of the 20th century, London was the largest city in the world by some margin (with New York City and Greater Paris having populations of 3.4 million and 4 million, respectively, at this time), and London's population exceeded that of several European countries. Furthermore, London developed through a largely haphazard and organic process during this period, which suggests that both the size and structure of the city responded to decentralised market forces. Therefore, 19th century London provides a natural testing ground for assessing the empirical relevance of models of city size and structure. The key idea behind our approach is that the slow travel times achievable by human or horse power implied that most people lived close to where they worked when these were the main modes of transportation. In contrast, the invention of steam railways dramatically reduced the time taken to travel a given distance, increasing average travel speeds from around 6 mph for horse-drawn vehicles and 3 mph for walking to around 21 mph, which permitted the first large-scale separation of workplace and residence. This separation enabled locations to specialise according to their comparative advantage in production and residence. Our evidence strongly suggests that a class of quantitative urban models is remarkably successful when using these changes in transport costs to explain the large-scale changes in the organisation of economic activity observed in 19th century London. Our findings highlight the role of modern transport technologies in sustaining dense concentrations of economic activity. This is a short version of our recent VoxEU piece (which provides more methodological detail). You might also enjoy Steve Redding's VoxEU interview on our research. How much will households pay to avoid council tax? Are you paying attention? In many situations research suggests not. For example, when we buy things online, on average we respond more to the purchase price than to the shipping cost. As the total comprises the sum of both costs, this doesn’t make sense. A series of recent tests look at whether we take full account of the future when we buy things that are durable, like cars or fridges. Much of this evidence suggests that for these types of purchases we tend to undervalue the future, in some cases by quite large margins. That is when we buy a new car we focus too much on the up front price, and not enough on future savings that come from better fuel economy. This matters from a policy perspective because it means we end up with too many gas guzzlers. In a recent paper, we apply these insights to the valuation of future Council taxes in home purchases. The basic idea behind our paper is to work out how much we pay upfront to reduce our Council Tax by one Pound every year (by looking at similar homes either side of Local Authority boundaries with different tax rates). As with the work on cars, we test to see if people pay attention to the discounted costs resulting from future property taxes. The bottom line is that on average it looks like they do: our figures suggest that £30 or so will buy you an annual reduction in Council tax of £1 per year. If we can assume this saving is indefinite, your £30 investment yields a return of between 3 and 4%. This seems a reasonable return as it sits roughly comparable to average mortgage rates over the period. Why do we care about this? Well for one it tells us that where we find some evidence that people are inattentive to the future in some places they appear to be pretty rational when it comes to home purchases (or at least in valuing the tax elements). Clearly one size does not fit all. However, we also find that beyond 2008 that discount rates implied by taxes remain flat, and as such become detached from prevailing real terms market rates. Although we are not yet in a position to fully explain why this is (that’s research, folks! ), it is clearly interesting because we’d expect changes in borrowing and lending rates to feed through to how people value the future. Our paper suggests that this is not always the case. 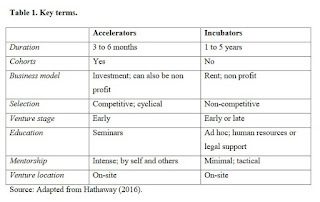 I’ve written a new CEP Discussion Paper on co-working, incubators, accelerators and what they mean for local economic development policy (co-authored with Margarida Madaleno, Henry Overman and Sevrin Waights). It builds on two toolkits for the What Works Centre for Local Economic Growth. Accelerators and incubators are business support programmes that provide co-working-based packages of support to young firms to help them grow. Widely used in the tech sector, they are now increasingly applied in other industries - including retail, fashion and design and household goods - even in the Bank of England. Why should we look at these interventions? In a nutshell, they’re now a very visible part of the UK urban landscape. 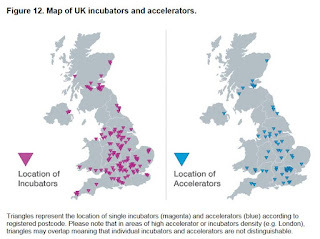 As of April last year, there were 771 incubators, accelerators and co-working spaces in Britain. NESTA have done some great work mapping their spread (see image). In particular, there’s been an explosion of co-working, incubator and accelerator provision in London: in 2014 there were at least 132 programmes, 50% of which had arrived since 2012, and in 2017 the capital had 171, more than the next ten cities combined. Together with pop-ups, co-working and evolving high streets, these flexible spaces and practices are - arguably - starting to change the wider urban fabric. It’s also important to look at these co-working models because of what they might achieve. In theory, incubators/accelerators can make entrepreneurs more effective, and help firms/founders to innovate. That feeds into long-term economic growth. In cities, they could also deepen clusters. They may also help groups - like some BME or female founders - facing structural barriers in ‘regular’ economic space. Given that over half of UK providers now have some public funding behind them, it’s particularly important to understand whether these programmes actually work. For the more selective business models, like accelerators, providers might just be picking founders and firms who would do well anyway – what economists call a selection problem. 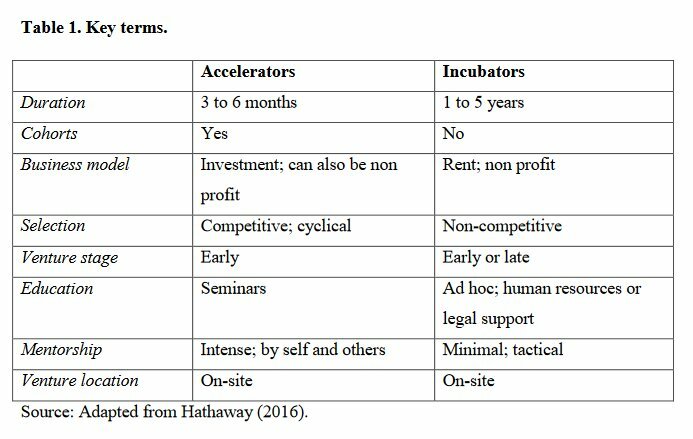 We define accelerators and incubators in Table 1, which is adapted from the Harvard Business Review. Put crudely, accelerators (like YCombinator or Entrepreneur First) offer short-term, intensive support to a competitively selected group of firms; while incubators (like TechHub) offer less-intensive, more ad-hoc support to firms on a rolling basis. Accelerators don't charge, and may take equity stakes; incubators typically charge rent. These are 'ideal-types'; in practice we see spaces (such as Second Home or The Trampery) which combine features of both. It’s also helpful to put these newer programmes in context: there’s a long history of co-working models (Figure 1). In the paper we set out four – linked - ways to think about what incubators and accelerators actually do. Urban economists would think of them as cities in miniature, offering matching, sharing and (especially) learning effects over and above what economic actors would encounter at urban or neighbourhood scale. In addition, economic geographers might focus on how programmes enable different kinds of proximity, and the pros and cons of that; management scholars would frame programmes as de-risking the process of entrepreneurship; and economic sociologists would think about economic communities of practice, where founders can develop an entrepreneurial identity. All of these analytical lenses are helpful, and all suggest important questions for evaluators. So what does the evaluation evidence tell us? We found fourteen high quality impact evaluations looking at incubators, accelerators or both. We also found eight further studies that look at researchers – often academics – in science parks, lab co-location and in ‘temporary co-location’ settings such as conferences. These provide good evidence that accelerators increase employment for firms who take part, compared to losing applicants (or similar non-participants). One of these also looks at firm sales, again finding a positive effect. The evidence for incubators is also positive, though less clear-cut. We find strong evidence that accelerators help cohort firms to raise external finance post-programme, typically angel or VC money. For incubators, we didn't - surprisingly - find any studies that tested this. Strikingly, both types of programme have a pretty mixed impact on firm survival: of the four accelerator studies that test this, for example, we find one positive, one mixed and two negative results. What's going on here? The most plausible explanation is that accelerators help participants to quickly gauge the quality of their ideas (e.g. via investor / peer feedback on demo days) and encourage those with weak propositions to quit early. That is, the programmes help kill bad ideas: one provider we spoke to told us they run 'startup funerals' to commemorate their passing, as founders move on to new things. It's rather harder to figure out just how accelerators and incubators achieve these effects - and thus, how to design programmes that reliably get to these outcomes. In part this is because fewer evaluations have explored these issues - so the following results need more caution. For example, we find no clear differences in outcomes when comparing public and privately-run accelerator programmes, although among the latter group, top programmes in the US (like YCombinator or TechStars) do seem to achieve better outcomes. The evidence for incubators is similarly inconclusive. We find that more specialist programmes (single industry) help survival compared to more generalist programmes. For incubators, training seems to be more effective than networking, although neither has much impact. Significantly, what goes on outside the building also seems to matter. For incubators, having university involvement is helpful (although this doesn't apply when individual academics step in). Two accelerator studies find that programmes in regions with denser entrepreneurial networks and high property values achieve better employment and funding effects. Not surprisingly, firms in these programmes are more likely to get funding from local investors. We also look at co-location of researchers, often academics. Results complement the findings for firms. Very close co-location seems to raise the quality/quantity of collaborations. Spillovers are biggest in closely related fields. It’s striking that both permanent and temporary co-location can help drive up these outcomes. Overall, we were impressed by how much high quality evidence already exists for accelerator and incubator impacts. We hope local policymakers will be able to work productively with providers to fill in some of the remaining gaps. Many of these are around how programmes achieve their overall effects, and how to consistently replicate this. More broadly, we also need to test accelerators against incubators, and against traditional business support. We also need a clearer sense of programmes' cost-effectiveness. We're not able to find cost data for incubators in the available studies - but in the toolkits we provide some back-of-the-envelope numbers suggesting that accelerators are pretty expensive to run. There are also some broader academic questions about how these very micro-scale interventions affect larger-scale urban processes. For instance, we know that clusters are characterised by positive and negative feedback loops. Productivity effects grow with cluster size, as the set of knowledge spillovers gets larger and richer; at the same time, growing clusters become progressively more crowded and expensive, often displacing smaller or newer firms. Co-working-based interventions can - in theory - simultaneously increase cluster productivity for a given size (by enabling innovation and entrepreneurship) and flatten the cost curve (by more densely co-locating firms in physical space).What might be the effect size of such provision, at what scale, and how might such interventions shape cluster trajectories? There is a big and fascinating agenda to explore here.